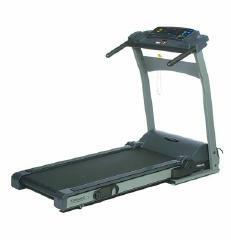 The Trimline T355 HR treadmill is Trimline’s high end folding treadmill. It is around $400 more expensive than the popular T345 treadmill but packs more features and better specs. Is This Treadmill for You? If you need a folding treadmill, this is one of your choices. It comes with the same folding features found in the T345 but it is also more expensive so be sure to check your budget first before making any buying decisions. This unit boasts a 2.5HP continuous duty motor that has a max speed of 11mph and a max incline of 12%. Compared to its cheaper counterpart this model really gives you more power. Like I said above, this is a folding treadmill. It features the same Softdrop deck lowering technology that made the T345 famous. This soft-drop hydraulics smoothly lower the unit so you can save up to 1/3 of the space required when unfolded. Once folded, it can easily be stored by simply pushing it on its wheels. The 5 preset and 3 custom programs give you more workout variety. Or, if you want, you can use the heart rate chest strap and do any of the 2 heart rate programs that are also built into this treadmill. The Walk, Jog, Run speed quick keys can be customized to meet your needs. This feature is perfect for those who use interval training in their workouts. It allows you to change your running speed with a push of a button. There’s no longer any need for you to hold down the speed key to increase or decrease the intensity of your workout. The 10 x 14 dot matrix visually displays course profiles so you can prepare for upcoming hills and other challenges. While the 9/16" LED displays provide feedback on time, speed, distance, incline, calories, pace, and heart rate… allowing you to easily monitor and adjust your workouts. Then after your workout, the results mode displays your average user speed, average heart rate, total calories, total distance, total elevation gain, and total treadmill odometer so you can measure your progress. Finally, the Trimline T355 HR treadmill comes with the classic high end Trimline warranty. It has 30 years frame and drive motor, 2 years parts, 1 year labor warranty. Another feature this machine offers is the orthopedic belt. This belt is much softer than ordinary belts, but the problem with orthobelts is that they're less durable. So if you buy this model, keep in mind that there might be some reliability issues in the future. I don’t recommend the Trimline T355 HR treadmill. If you want a folding treadmill, stick with the cheaper T345 model. You’ll get more value for your money. Warranty: residential warranty of 30 years - frame & drive motor, 2 years - parts, 1 year - labor. If you plan on buying a Trimline T355 HR treadmill, I suggest you buy it at amazon. They offer the cheapest price around the net. You can get it for just $2,198.00.